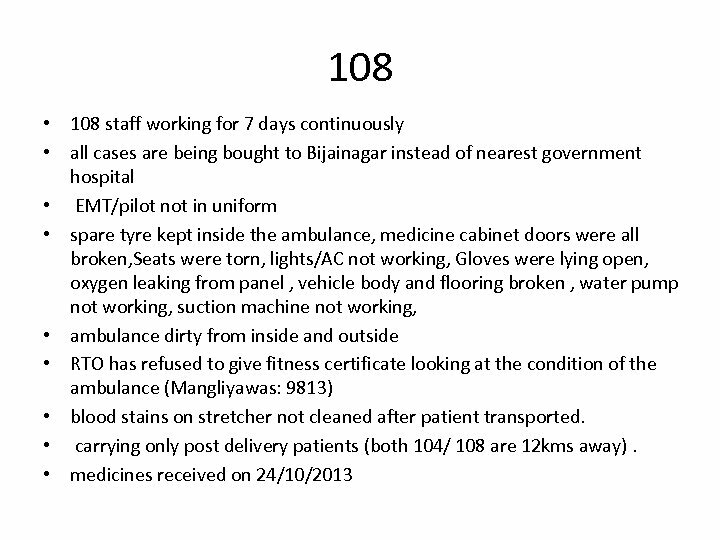 Good practices • Cleanliness of Toilets/Wards was good • Hot food was being given as per schedule after delivery. • JSY payments were being made on time and no gaps were identified. 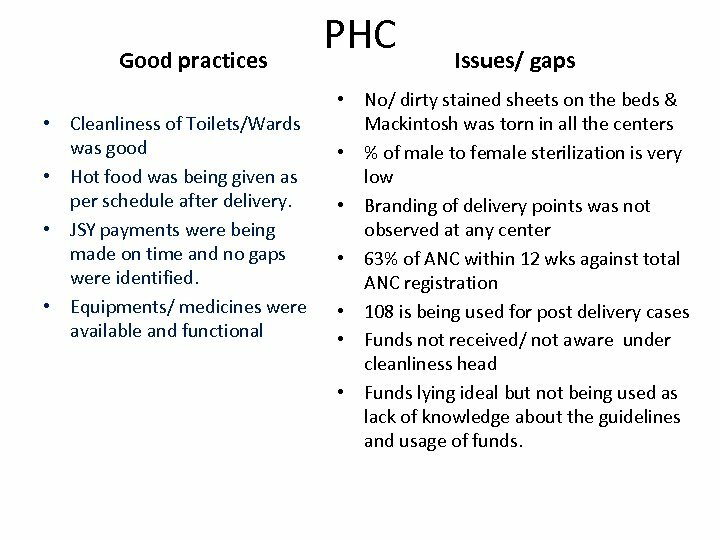 • Equipments/ medicines were available and functional PHC Issues/ gaps • No/ dirty stained sheets on the beds & Mackintosh was torn in all the centers • % of male to female sterilization is very low • Branding of delivery points was not observed at any center • 63% of ANC within 12 wks against total ANC registration • 108 is being used for post delivery cases • Funds not received/ not aware under cleanliness head • Funds lying ideal but not being used as lack of knowledge about the guidelines and usage of funds. 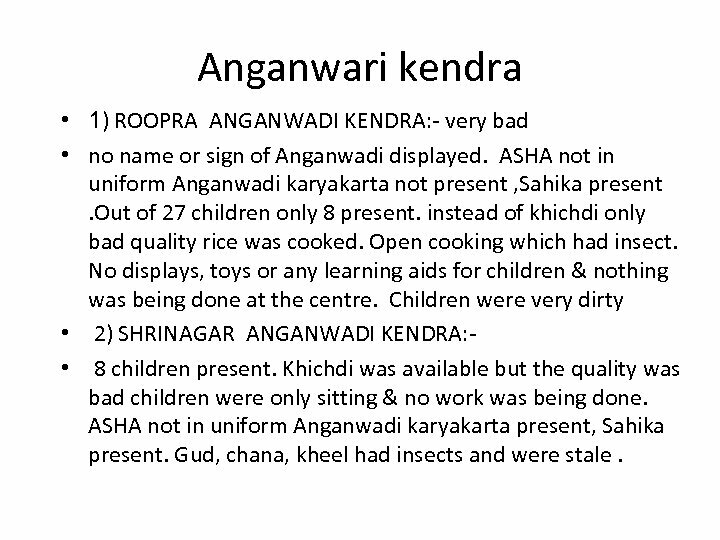 Anganwari kendra • 1) ROOPRA ANGANWADI KENDRA: - very bad • no name or sign of Anganwadi displayed. ASHA not in uniform Anganwadi karyakarta not present , Sahika present . Out of 27 children only 8 present. instead of khichdi only bad quality rice was cooked. Open cooking which had insect. 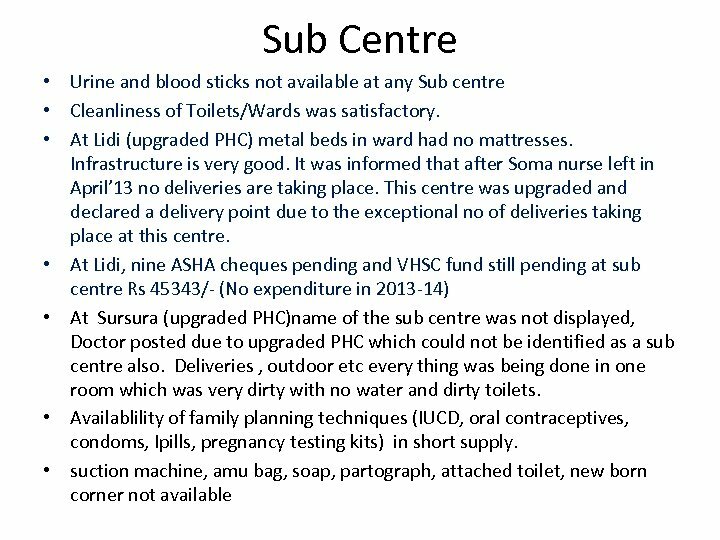 No displays, toys or any learning aids for children & nothing was being done at the centre. 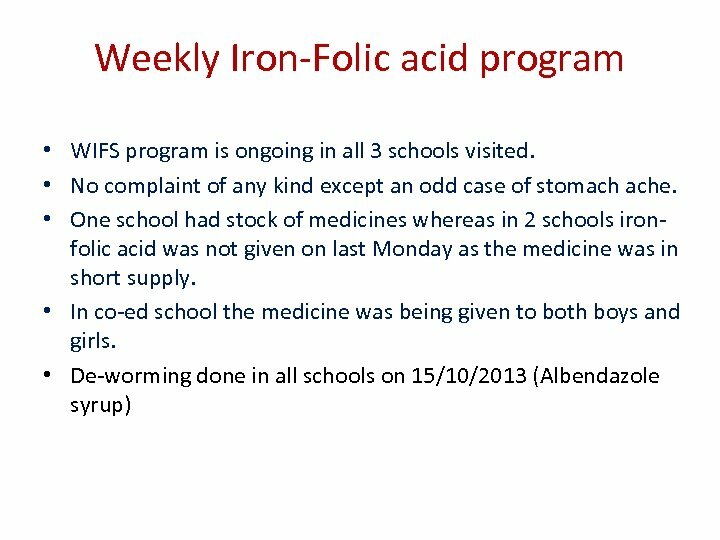 Children were very dirty • 2) SHRINAGAR ANGANWADI KENDRA: • 8 children present. Khichdi was available but the quality was bad children were only sitting & no work was being done. ASHA not in uniform Anganwadi karyakarta present, Sahika present. Gud, chana, kheel had insects and were stale. 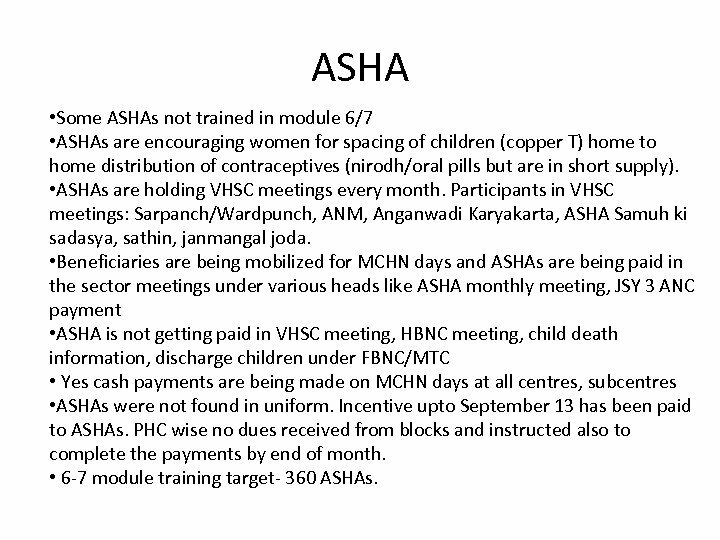 ASHA • Some ASHAs not trained in module 6/7 • ASHAs are encouraging women for spacing of children (copper T) home to home distribution of contraceptives (nirodh/oral pills but are in short supply). 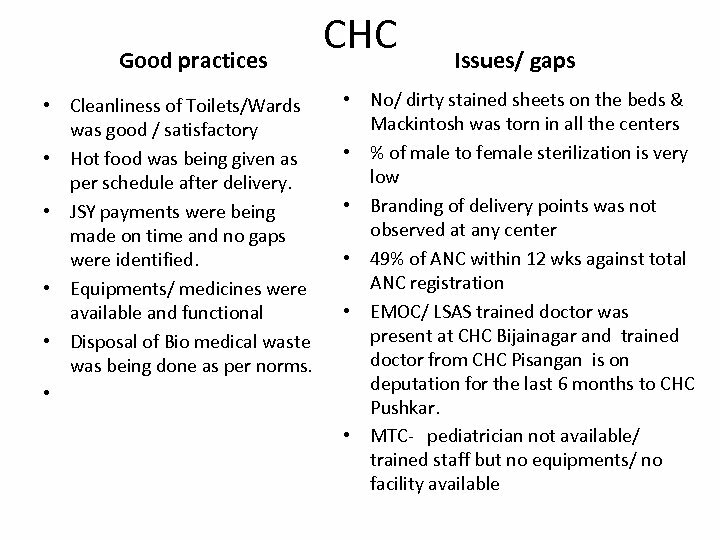 • ASHAs are holding VHSC meetings every month. Participants in VHSC meetings: Sarpanch/Wardpunch, ANM, Anganwadi Karyakarta, ASHA Samuh ki sadasya, sathin, janmangal joda. 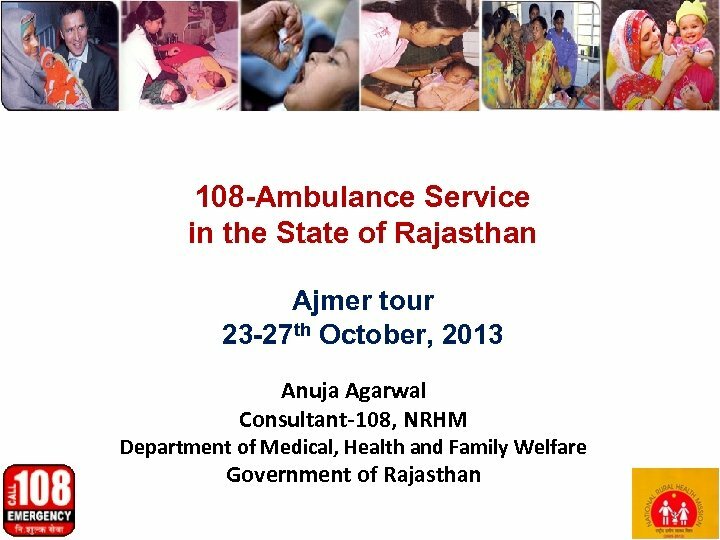 • Beneficiaries are being mobilized for MCHN days and ASHAs are being paid in the sector meetings under various heads like ASHA monthly meeting, JSY 3 ANC payment • ASHA is not getting paid in VHSC meeting, HBNC meeting, child death information, discharge children under FBNC/MTC • Yes cash payments are being made on MCHN days at all centres, subcentres • ASHAs were not found in uniform. 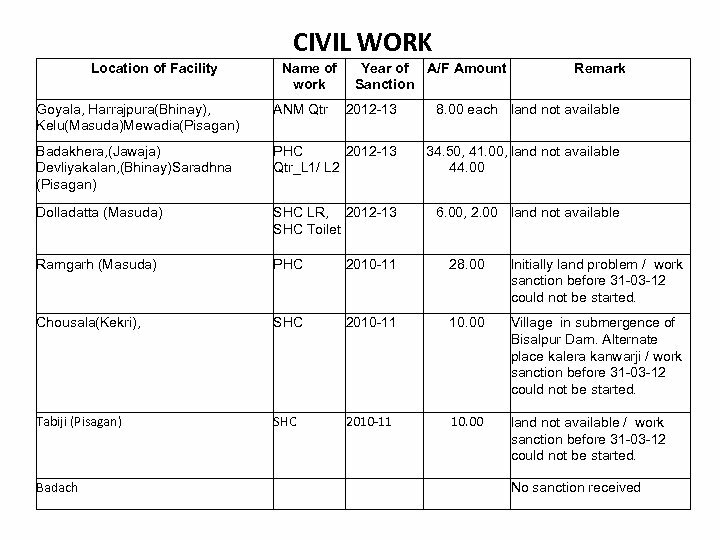 Incentive upto September 13 has been paid to ASHAs. PHC wise no dues received from blocks and instructed also to complete the payments by end of month. 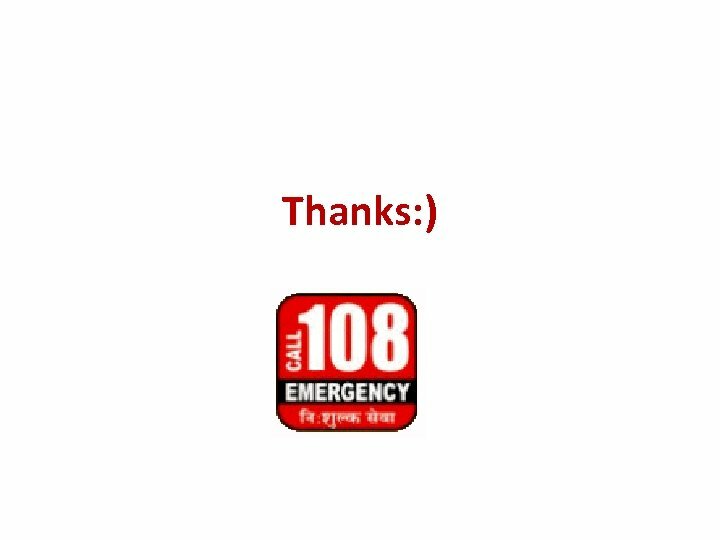 • 6 -7 module training target- 360 ASHAs.